I built these red A birdhouses a few years ago from scrap I pulled out of my house and the birds love them. 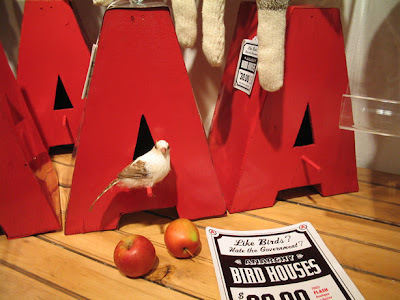 Further evidence that birds prefer sans serif! Sharp-eyed viewers will note his information leaflet provided with the birdhouses -- "Like birds? Hate the government? Anarchy BIRD HOUSES"